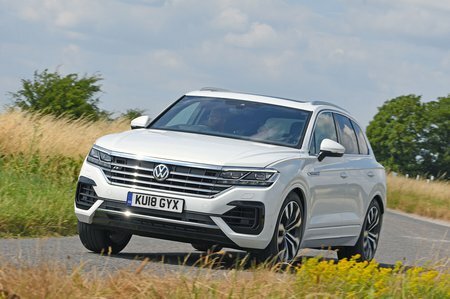 Volkswagen Touareg 3.0 V6 TDI 4Motion 231 R Line 5dr Tip Auto 2019 Review | What Car? What Car? will save you at least £3,927, but our approved dealers could save you even more. As you’d expect from a trim beginning with the letter R, the main thing you’ll notice with this are the sporty bodykit, 20in wheels and body-coloured wheel arch protectors. Inside, there’s aluminium and gloss black trim, ‘R-Line’ embossed on the seats, a heated R-Line steering wheel, wireless phone charging, extra USB ports, quad-zone climate control and a powered tailgate. Although some of that equipment is handy, we’d just add those options to SEL and pass on the sporty bits. At the moment, there’s a pair of 3.0-litre V6 diesel engines to pick from. This 228bhp version is the entry-level unit and is paired exclusively with an eight-speed automatic gearbox and four-wheel drive. Performance is more than adequate and it’s very quiet at a cruise, if a little clattery at idle. There’s some hesitation when you’re pulling away from a standstill or waiting for kickdown on the move, but it isn’t as pronounced as in the higher-powered variant.